On October 30, 2015, the U.S. Securities and Exchange Commission (the “SEC”) adopted final rules on crowdfunding and issued proposed amendments to certain Securities Act rules with the purpose of facilitating certain kinds of crowdfunding. These adopted rules may provide construction project owners with the more “modern” option of crowdfunding their projects and a broader investor base, and the proposed amendments may provide these owners with a less onerous process by which to seek investors. The proposed amendments are subject to the notice and comment period and address at least two important securities rules. One of the proposed amendments is to amend Rule 147 of the Securities Act, which addresses intrastate offers, to offers that seek to sell no more than $5 million in a 12-month period, impose limitations on investors, eliminate the offer restriction while keeping residency requirements, and relaxing issuer eligibility requirements. The other proposed amendment is to Rule 504 of Regulation D, and seeks to increase the sale limit from $1 million to $5 million in any 12-month period, and to disqualify certain bad actors from participation in such offerings. These proposed amendments are subject to the notice and comment period, and as such are only initial proposals; you may make comments on these amendments. The final rules adopted by the SEC require reporting and registration by certain crowdfunding platforms and companies seeking funding (for the portals, i.e., being on the Form Funding Portal and becoming a member of FINRA; for the companies, i.e., disclosure of the price of securities, discussion of financial condition, description of funds use, providing financial reports, among others). These rules also broaden the scope of the investors who may participate in such crowdfunding efforts. Specifically, the final rules allow companies “to raise a maximum aggregate amount of $1 million through crowdfunding offerings in a 12-month period” and would allow individual investors “to invest [over a 12-month period] in the aggregate across all crowdfunding offerings up to”: (1) whichever is greater: (a) $2,000, or (b) 5% “of the lesser of their annual income or net worth,” if their annual income or net worth is less than $100,000; or (2) 10% “of the lesser of their annual income or net worth,” if their annual income or net worth is equal to or greater than $100,000. In layman’s terms, these rules, on their face, allow companies to raise up to $1 million through crowdfunding efforts within a consecutive 12 month period, and would allow individuals whose net worth is less than $100,000 to contribute to such projects. As the final rules slowly come into effect, it is important to note that existing regulations have not stopped funding portals from being successful even with currently eligible investors. Fundrise is one of several different online portals that facilitate a “crowdfunding” effort for construction projects, most of which appear to be commercial projects. Even with the current rules, Fundrise markets itself by saying that “[c]ommercial real estate has traditionally been one of the most lucrative private investments around, but never before has it been available to you,” seemingly to suggest that funding a commercial real estate project, while previously being “reserved,” in so many words, to the rich or banking/investment institutions, now is being opened up to more of the general public (and the proposed amendments will open this field up even more). Fundrise also sets out statistics for different kinds of projects that they will fund (and their suggested financing): (1) single-family homes or small-balance commercial projects (blended senior and mezzanine loans); (2) mid-market commercial developments or rehabilitative projects (mezzanine debt or preferred equity); (3) large transaction or institutional co-investment projects (preferred equity). This seems to suggest that, given the right company and proposal, Fundrise can help a project owner to develop a residential community. As an example of a funded construction project – and a high profile one – Fundrise’s poster-project is 3 World Trade Center – a mixed-use (offering retail and residential spaces) building set in the Financial District in Manhattan. While this funding project is now closed, Fundrise gives the potential investor a litany of information on the project, setting out the minimum investment amount ($5,000), the underlying security, the term, projected annual return, along with other information. And even with these investors being subject to SEC requirements, it still does not beat the fact that, if you have $5,000 sitting around and a good accountant, you could be an “owner” of the 3 World Trade Center project. How cool is that? Investment crowdfunding, which is the newest crowdfunding model, pairs commercially viable small and medium-sized enterprises (SMEs) with profit-seeking investors. The SMEs who pursue financing through this model tend to be better organized because they must induce investors to choose their projects over competitors by convincing them that they have a greater chance of profit. Investors, in turn, demand more of the SMEs in the way of disclosures because they are looking for the most profitable venture. This process is known as the “wisdom of the crowd”. The investment model initially appeared in the United States though portals that used existing laws to connect debt issuers and investors. In the earliest ventures, contract law was utilized to facilitate peer-to-peer (P2P) lending. Later, portals utilized security registration exemptions to sell equity and debt securities to accredited investors. Now, laws are being drafted around in the United States and around the globe to accommodate the sale of equity investments to retail investors through crowdfunding. The model is rapidly expanding and growing more sophisticated by the day. The earliest use of the investment model in the United States was P2P lending. P2P lending portals grew rapidly during the recent financial crisis and subsequent recession as individuals and SMEs found banks were unwilling if not unable to lend. Lending Club, Prosper, and others led the way in lending billions of dollars within the first couple of years. Unfortunately, the SEC clumsily applied costly and cumbersome securities regulation to P2P portals in a way that punished the first wave of portals for their innovation. Frustrated, the portals either closed or turned to long-standing accredited investor exemptions for legal support. After the rise and stall of P2P lending portals, the investment model of crowdfunding came of age in California’s Silicon Valley. There, tech-based startups sought equity and debt financing from wealthy individuals and venture capitalist funds. The portals facilitating these deals relied on long-standing exemptions to securities registrations rules within the Securities Act of 1933 (the Act). The portals lost the ability to reach retail investors in adopting these business models. In exchange, they gained valuable legal certainty. Portals like AngelList and Crowdfunder who accepted that trade-off have done quite well, facilitating billions of dollars in investments. These investment model crowdfunding portals tend to downplay their role in facilitating investments due to regulatory constraints. AngelList, for example, describes itself as merely “a portal for startups to meet investors, candidates, and incubators.” Portals allow SMEs to upload their corporate documents and solicit investors registered with the sites. Personal negotiations often follow. This conception of investment model portals as meeting places is a consequence of United States securities laws defining a broker subject to extensive and expensive regulation as “any person engaged in the business of effecting transactions in securities for the account of others”. AngelList and its peers have no desire to subject themselves to broker-dealer regulation. The position taken by the portals in relation to broker-dealer regulation has had a substantial effect on the model’s development. The investment model in the United States is highly interactive and allows specialized deals to be reached between entrepreneurs and financiers. Despite the flexibility in negotiating deals, the United States investment model has been limited since it adopted the exemptions of the Act as a legal basis. The most critical limitation is that entrepreneurs may only sell securities to a small class of wealthy investors on the investment model portals. The crowdfunding provisions of the JOBS Act, which will take effect when the SEC promulgates final rules, allow portals to solicit equity investments from retail investors for the first time. Both crowdfunding models are disrupting the traditional lending process by allowing SMEs to raise capital from individuals with laptops, tablets, and smartphones instead of from brick and mortar financial institutions. Furthermore, it seems that each model may have its own distinct place in the economy. Given the usefulness of the two models and their variations, it is important for entrepreneurs, investors, portal managers, legislators, and lawyers to understand how and when each should be employed. Only the investment model, however, has the potential to dramatically reshape the economy by changing the way large amounts of capital are used and allocated across the economy. This potential to transform central components of the nation’s economic infrastructure is the reason that the investment model faces greater legal and regulatory challenges. Even once the right framework is in place, however, stakeholders much learn to use it effectively. It is widely-noted that “crowdfunding is in a very early and noticeably unsettled state”. It is like any sprawling new system in that there is an ongoing struggle amongst experts to define it generally and to classify its component parts. The term crowdfunding still means many different things to different people. With that in mind, perhaps the worst mistake one can make in speaking of crowdfunding is to assume one’s audience understands crowdfunding to mean the same thing the speaker does. One’s personal understanding of the term is shaped by experience, jurisdiction, and other variables. Crowdfunding, as used in this post, means a process by which SMEs receive small amounts of financing from a large number of people. This is a broad and flexible definition. Leaving the definition of crowdfunding broad and flexible does not mean that we are unable to identify its components. In fact, that is a step which should be taken without delay so that the appropriate systems can be built to support distinct crowdfunding models. However, this endeavor is also a difficult one. Just as views on the definition of crowdfunding itself vary, views vary across the global community of experts as how best to divide the crowdfunding space. Steven C. Bradford, a leading crowdfunding researcher, has classified crowdfunding into four models: lending, donative, reward-based, and equity. Others have sought to pare down the list further. Terence Tse and Mark Esposito, writing for the Harvard Business Review, divided crowdfunding into lending, equity, and donative models. An assumption with the Tse and Esposito view is that whether a donor is given a reward or not matters little in describing the nature of the financing. It is, reward or not, a donation of capital with no desire for, expectation of, or right to profit. This blog post and its counterpart on the investment model continue the trend of consolidation by dividing crowdfunding into just two models: donative and investment. This simplified classification system draws on the motivation of crowdfunding financiers by basing the only division on whether profit is sought by the financiers. As noted by Tse and Esposito, the prospect of a reward does not change the donative nature of the financier’s act. Therefore, there is no reason to sub-divide donative model offerings. Likewise, whether profit comes from debt or equity securities is of little consequence to financiers choosing the investment model. Therefore, all offerings in which the financier provides capital with the expectation of profit should be classified as investment model offering. This means crowdfunding as just two models: donative and investment. This blog post is dedicated to the former while a post to follow will address the latter. The donative model is perhaps the one most people associate with the term crowdfunding. In the donative model people post their conceptualized projects online and ask donors for the necessary funding. The possibility of profit is not suggested by the solicitation. Creative projects like music albums, a series of paintings, and fashion creations are common in the model. The breadth of offerings is much greater though. Any person or entity whose project is unlikely to earn a profit might use the donative model. The use of donative crowdfunding to-date has been almost as wide as the model’s theoretical scope. The 2008 presidential campaign of Barack Obama used donative crowdfunding to raise funds. The donative model was used to acquire The Three Graces by Lucas Cranach for The Louvre’s collection. Comedian Jon Stewart even launched a humorous campaign on Kickstarter to raise $10 Billion for the acquisition of cable news service CNN. The possibilities within this model are nearly limitless. The donative model that has been active in the United States is so old that at least one court found a donative crowdfunding site was functioning in 2003 – 3 years before the term crowdfunding was supposedly coined. The donative model is represented in the United States by the highly-successful portals Kickstarter and Indiegogo. Both of those portals provide a portal for people and entities to ask for donations in exchange for rewards. Those rewards might be first editions, special editions, or early delivery of the entrepreneur’s product. The donative model portals active in the United States keep their operations wholly outside of government financial regulation through the use of well-chosen terms, disclaimers, and disclosures. The sites state that the financiers aren’t investors and they aren’t consumers. They are just good people making sure that good art is made when traditional systems have failed to do so. For many Americans, the opportunity to contribute to the realization of creative projects is enough to inspire a donation. Millions of people have visited the sites to donate over the past 5 years and the impact on the traditional financial model has been substantial. $5 Billion has been donated through the end of 2013. $3.5 Billion was donated in 2012 and 2013 alone. These astounding sums and the rapid growth of the model is why CNBC listed Kickstarter as the 49th greatest business disruptor of the 2013 alongside names like Uber, Spotify, and Dropbox. Central North Carolina residents wait all year for the nine day fried food and fun fest that is the Dixie Classic Fair. The fair features events from swine racing to wine tasting (which would be a great slogan), and houses exhibits such as the Yesterday Village and the Barnyard Zoo. For the past couple of years the fair has featured an exhibit that honors our nation’s military veterans, aptly named the Veterans Wall of Honor. 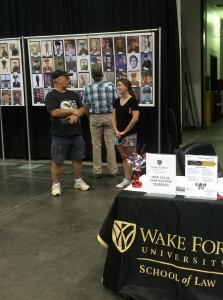 The Veterans Wall of Honor gives retired service members and their families the opportunity to have their photographs displayed at the exhibit every year during the fair. As of this year the exhibit has almost 600 photographs on display. In keeping with the theme of honoring our veterans, students from Wake Forest University School of Law’s Veterans Legal Clinic were present at the exhibit to get the word out in the community that they’re ready to help. Clinic students handed out flyers and business cards, and spoke with patrons of the fair who had come to check out the Veterans Wall of Honor. As one would assume, many visitors to the exhibit were themselves veterans or family members of veterans, and were very happy to hear that the school was doing their part to help this famously under-served population. Students were given an opportunity to talk directly to the veterans in attendance about the services the clinic plans to provide, and get immediate feedback from the population that is the focus of their efforts. The Veterans Legal Clinic provides legal services in the following practice areas: Employment Law, Consumer Protection, Discharge Upgrades, and Landlord/Tenant Law. The focus of the Veterans Legal Clinic is to fill a gap in legal services available to current and former military personnel that are currently unmet by other legal service organizations. To further this goal, the Veterans Legal Clinic has chosen not to focus on VA Benefits claims at this time. There are several other organizations through North Carolina, including other law school legal clinics that provide legal services for VA Benefits claims. The Veterans Legal Clinic also does not provide legal assistance for family law or criminal law issues. For more information on the Veterans Legal Clinic please visit the website at http://veteransclinic.law.wfu.edu/, contact us at 336-758-4950 or vetclinic.wfu@gmail.com. Veteran on Military Day at the Dixie Classic Fair. Anyone whose parent is not on the board of a bank knows that getting a small business loan is not the simplest process. Banks owe a duty to their depositors (and to the Federal Deposit Insurance Corporation) to exercise due diligence before making a loan to perspective creditors and, as such, must evaluate the creditworthiness of those creditors. These evaluations often involve an analysis of the creditor’s borrowing and repayment history, evidence of the business’s monthly cash flows, a balance sheet showing other outstanding loans, and may require the business owner to personally guarantee the loan on behalf of his business. In addition to the personal fitness requirements of the borrower to repay the loan the lender may, in some cases, sue the borrower if the money being lent is not used for its intended purpose. Contrast these requirements with money raised through a crowdfunding campaign, and you would suspect that crowdfunding entrepreneurs are merely artistic types who are displaying their creativity on crowdfunding platforms as a means of seeking compensation for being clever. Campaigns that support this suspicion include the potato salad that raised $55 thousand, and the “Cloud Project” that raised $7 thousand for the purpose of “[hiring] a man in a plane to write stupid things with clouds in the sky.” Now, you may ask yourself (or you may not because, who cares) what happens if these “entrepreneurs” don’t make potato salad, or don’t “write stupid things with clouds in the sky?” Will the backers of these noble endeavors have both the right to demand that their money be returned, and the courage to admit to the public that they donated to these projects? The latter part of the question is up in the air, but as for the former part of the question, it’s beginning to look that way. A default judgment issued by the King County Superior Court in Washington State will go down in the history books as the first court order requiring a crowdfunding campaigner to pay civil penalties for not honoring the promises it made to backers of the campaign. The judgment, totaling $54,851.29 in restitution and penalties, is against Altius Management, a campaigner that promised 810 individuals who donated a total of $25,146 to the campaign that it would use those funds to develop “horror themed” playing cards. As an added bonus, many of the backers were promised their own deck of cards upon completion of the project with an estimated delivery date of December, 2012, just in time for the holiday season. As of July of this year (it’s 2015 by the way), not a single backer who was a party to this judgment has received any “of their promised rewards” according to the court filing. It should be noted that in order to benefit from this judgment, you would have had to have been one of the 31 backers, of the 810 nationwide, who live in King County, Washington. This means that we should hope to expect to hear 779 other individuals from various other parts of the country voicing their displeasure with Altius by way of a formal complaint to their respective state’s court. But they better get in while they still can, because of the nearly $55 thousand judgment levied against Altius Management, only about $700 of it was actually restitution to be returned to the backers of the campaign. In other words, the state of Washington is levying what amounts to a $54 thousand penalty (fines and attorney’s fees) against Altius for allegedly swindling its residents out of $700. If other states take the same approach, Altius (assuming they even have enough to pay the fines from this judgment) will likely not be long for this world. This judgment comes on the heels of a settlement earlier this year between the Federal Trade Commission and crowdfunding campaigner Erik Chevalier. Mr. Chevalier was ordered to repay the approximately 1,200 backers the $122 thousand he received from them for the purpose of developing a board game (yes, it was a horror themed board game). Though Mr. Chevalier pleaded with regulators that he sincerely tried to get this project completed, and never intended to defraud backers, the FTC didn’t see it that way. Not surprisingly, this settlement has been suspended because of Mr. Chevalier’s inability to pay. Does it seem unlikely to anyone else that crowdfunding has been around for approximately 10 years now and these are the first two campaigns that broke their promises to backers? So why bring the hammer down now? Well, this could be a bit of cleaning house before the in-laws get here. As the highly anticipated final rules from the Securities and Exchange Commission regarding the crowdfunding portion of the JOBS Act are hopefully upon us, a bit of house cleaning may be necessary to instill confidence in investors that crowdfunding is a relatively safe and adequately regulated platform for investing. It could also be argued that this is just a matter of regulators catching up to new technologies, and finally giving adequate weight to transactions that probably left them befuddled on first approach (I’m looking at you potato salad). Regardless of the reason for these new developments, one thing is for sure, entrepreneurs who are interested in using crowdfunding as a means of raising capital had better keep their promises. The following post was written by guest blogger and CLBC student Dan Waxman (JD ’14). When forming a start-up venture, an entrepreneur must decide which form of legal entity best suits the business’s needs. For example, an individual forming a small, family-run business may decide to form a limited liability company (“LLC”) due to its favorable tax treatment and relatively few formalities. However, should the business require venture capital (“VC”) funding, the corporate form is likely the best option, as VC investors generally refrain from investing in LLCs and other non-corporate entities. Once a corporation is formed, an issue arises concerning the distribution of ownership interest in the corporation. For example: How many shares should the corporation authorize? Should it authorize preferred shares? If so, what are the terms of the preferred shares? Will potential investors agree to pre-set terms? The good news is that many of these questions can be postponed until more information is obtained from potential investors. For example, a corporation can always authorize more shares with the approval of a majority of its board of directors and shareholders. Therefore, a sole owner can (while following certain formalities) file a share authorization form with the secretary of state should a VC investor require a greater number of authorized shares. Furthermore, VC investors generally prefer to purchase preferred (as opposed to common) stock in a startup. This is because the investors have more leeway concerning the rights granted by preferred stock relative to common. The question then becomes which rights should the stock contain and which will the investors prefer? Such questions generally remain unresolved until the investment negotiation process. Therefore, corporate law allows the corporation to authorize “blank check preferred” stock. Essentially, the stock is authorized without set terms. This allows corporate agents to negotiate with potential investors while using the characteristics of the preferred stock (dividend rights, participation, liquidation preference, convertability, voting rights, etc.) as bargaining leverage. It also allows the corporation to easily create new classes of preferred stock. Once the parties have settled on a mutually agreeable term structure, corporate management can issue preferred stock (from the pool of unissued blank check preferred shares) containing the agreed-upon rights without having to re-authorize additional shares. Therefore, when forming a corporation in anticipation of VC investment, authorizing blank check preferred stock in addition to the corporation’s common stock can ease concerns over the proper composition of the preferred stock and facilitate investment negotiations. On Friday March 21, 2014 the Community Law & Business Clinic’s Arts & Entertainment Group gave a presentation to students at Winston Salem State University about legal issues facing artists. Presenters included third year law students Disha Gandhi, Leslie Evans, Michael Glotzbach, James Goodwin, and Christopher DiGirolamo. Presenters covered a variety of topics such as trademarks and copyrights, contracts, and tax issues. The presenters also discussed many issues students were concerned about in a Q&A session, ranging from graphic design and creating logos for companies to music sampling and unintentional infringement. There were many legal issues that the students had not considered and the presenters were able to help them see that there are solutions, as well as ways to prevent these problems from occurring in the first place. Working with an attorney before you begin any project is one of the best ways to prevent an issue from arising. Read more about the presentation in this article from the Winston Salem Chronicle. If you are an artist or entertainer and would like legal assistance or more information about legal issues facing you or your business, please contact the CLBC. Wednesday, March 19th 2014. In partnership with Associated Artists of Winston Salem, the Community Law & Business Clinic’s (CLBC) Arts & Entertainment Group led an informative presentation about practical legal issues relevant to artists. The presenters, Leslie Evans, Disha Ghandi, Michael Glotzbach and James Goodwin covered topics such as trademarks and copyrights, insurance protection and tax compliance. The recent sale of WhatsApp to Facebook for $19 billion is a high-profile indication that products of the creative process can be valuable indeed. Unfortunately, without proper legal guidance and compliance, creativity-based businesses and individual artists can be blindsided by trouble, often before they can get traction in the marketplace. Being fluent in these topics and working with an attorney who understands the field can often head off issues before they arise. You can see pictures from the event at AAWS’s Facebook page. You may also download a copy of the presentation. If you are an artist or entertainer and would like legal assistance or more information about legal issues affecting you or your business, please contact the CLBC. The following post was written by guest blogger and CLBC student John Nail (JD ’14). Download a digital copy of this guide. Determining which section of the Internal Revenue Code to pursue tax exemption under is an important consideration for nonprofit planners, one that will likely have a lasting impact on their organization. Most nonprofits receive tax-exempt recognition by meeting the requirements of a charitable organization under section 501(c)(3); however, many entities that fail to meet those strenuous requirements may qualify for recognition as a “social welfare organization” under section 501(c)(4). This post looks at the requirements for a “social welfare organization” and provides a brief comparison between social welfare organizations under section 501(c)(4) and charitable organizations under section 501(c)(3). An entity is exempt under section 501(c)(4) as a “social welfare organization” if it is operated exclusively for the promotion of social welfare, which means that the entity is engaged in some way in promoting the common good and general welfare of the community. A social welfare organization cannot provide a benefit for a private group or for its members; however, the organization does not have to benefit every member of society equally if any limitations on the benefit are a result of the activity the organization pursues and are not imposed by the organization. While the exemption may seem overly broad, the IRS has analogized section 501(c)(4) to a “catchall” provision for beneficial nonprofit entities that are not exempt under other provisions of the Internal Revenue Code. Section 501(c)(4) has been used by a wide range of entities, including those that supervise facilities that teach safe handling and care of firearms, conduct annual festivals to further regional customs and traditions, and are created to make loans to businesses to induce relocation to economically depressed areas. There is substantial overlap between entities that would qualify as charitable organizations under section 501(c)(3) and social welfare organizations under section 501(c)(4), but there are several differences that should be considered. First, contributions to a 501(c)(4) organization are generally not deductible for the donor, but they are under section 501(c)(3). Second, a 501(c)(3) entity risks its tax exemption if it engages in any insubstantial nonexempt activities (like political lobbying), while a 501(c)(4) organization can engage in nonexempt activities as long as those activities are not the primary activities of the organization, which can still result in substantial nonexempt activities. The “primary activities” of a social welfare organization is determined by looking at the facts and circumstances that surround the activities. Finally, an organization is not operated for social welfare if its primary activity is carrying on a business with the general public; however, an organization exempt under section 501(c)(3) may operate a business if the sole purpose for the business is to raise funds for charity. While there are benefits to pursuing exemption under other provisions of the Internal Revenue Code, the catchall qualities of section 501(c)(4) provides many beneficial entities a pathway to tax-exempt status and should be considered by nonprofit planners. For more information see IRS Guidance on Section 501(c)(4) Organizations and Requirements for Exemption – Social Welfare Organizations.